Russell Smith was born March 19, 1950 in Alert Bay, British Columbia. At the Northeast Coast of Vancouver Island, Alert Bay is part of the Kwakwaka’wakw territory that reaches the adjacent mainland and covers the many Islands inbetween. 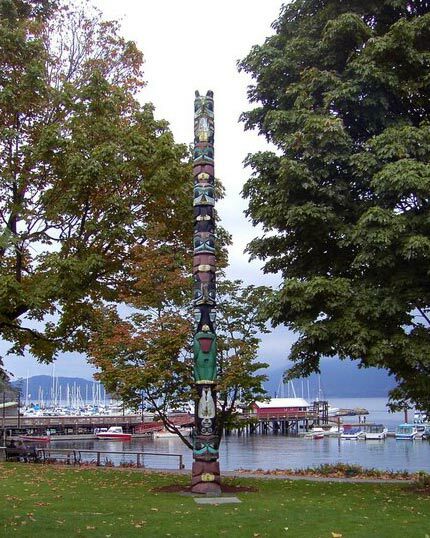 The Kwakwaka’wakw – "speakers of Kwakwala" – or Kwakiutl Nations, are the Northwest’s masters of art and drama. Russell is the direct descendant of six chieftain bloodlines. His mother, Elizabeth Abraham of the Thunderbird Clan, was a great maker of button blankets and a keeper of her family’s oral history and genealogy. She taught Russell and his brothers the traditions of Kwakiutl social order and language. Russell’s paternal grandfather, Hope Island Chief Jerry Brown, was a historically noted Kwakiutl Chief. He was so faithful in his adherence to Kwakiutl tradition that he was arrested and imprisoned for potlatching in 1922. Russell began woodcarving in 1968. Within a year Bill Holm, the renowned artist and leading authority on Northwest Coast Native Art, asked him to assist in the restoration of a southern Kwakiutl Longhouse at the Pacific Science Centre in Seattle which opened in 1971. In the early 1970’s, with the encouragement of cousin Lloyd Wadhams, Russell began working with precious metals. In 1977 he learned the art of repousse from Bill Reid, Gerry Marks, Phil Janze and the English goldsmith, Peter Page. He has gone on to create stunning pieces in gold, silver, and copper. Russell has studied extensively the ancient and traditional designs of his Kwakiutl heritage. From a deep fountain of stories, songs, dances, legends, spirits, and mythical creatures, Russell recreates images in wood, ivory, paint, and precious metals. The works of Russell Smith are housed in private and public collections around the world. Sadly, Russell Smith passed away in 2011.